• Gold Medal in Junior Boys Team & Junior Boys Doubles in South Asian Junior Championship at Pakistan in 2014. • Secured 2nd Position in Junior Boys Team in Slovak Open at Slovakia in 2014. • Participated in Asian Junior Championship at Mumbai, India in 2014. • Participated in Polish Junior & Cadet Open at Poland in 2014. 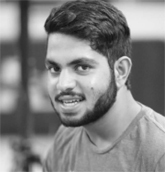 • Participated in The Volkswagen World Junior Championship at Hyderabad in 2012. • Participated in Egypt Cadet & Junior Open at Ismailia in 2013. • Participated in The U.S. Open at Milwaukee in 2011. • Selected for The Camp in Sweden for World Championship in 2012. • Silver Medal in Junior Boys Team, 3rd Position in Youth Boys Team and 3rd Position in Junior Boys Singles in Junior & Youth National Championship at Guwahati in 2014. • Bronze Medal in Junior Boys in National Ranking Tournament at Gandhidham in 2013. • Gold Medal in National Ranking Tournament ( South Zone ) in Junior Boys at Bangalore in 2012. • Gold Medal in Both Team as well as Individuals in U-19 Boys in National School Games held at Thyagraj Stadium, Delhi in 2013. • Bronze Medal in National Ranking T.TTournament at Thyagraj Stadium, Delhi in 2012. 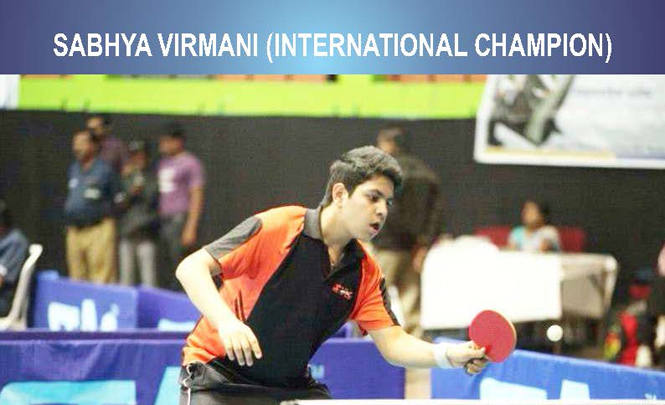 • Bronze Medal in Junior & Youth Inter State National Championship at Indore in 2013. • Gold Medal in Team Junior Boys in 57th National School Games at Rajkot in 2012. • Bronze Medal in Junior Boys in All India Ranking T.T Tournament at Dadoji Konddev Stadium, Thane in 2011. • Bronze Medal in Junior Boys in Indian Oil Servo National Ranking T.T Championship at Sree Kanteerava Indoor Stadium, Bangalore in 2010. • Gold Medal U-19 Boys in Inter School Sports And Games Competition at Sanmati H.S. School, Indore in 2010. • Silver Medal in Sub Junior Boys in Inter School Sports And Games Competition (CBSE) at School of Scholars , Wanadongri , Nagpur in 2009. • Silver Medal in Sub Junior Boys Team & 3rd Position in Sub Junior Boys Doubles in Neyveli Lignite Corporation Ltd. 71st Sub Junior Nationals And Inter State Championship at Jawaharlal Nehru Multipurpose Indoor Stadium, Chennai In 2009. • Gold Medal in Sub Junior Boys Team in 55th National School Games at Godhra in 2009. • Bronze Medal in Cadet Boys Team in Velammal 69th Sub-Junior National And Inter State T.T Championship at Multipurpose Indoor Stadium, Chennai in 2007.